Top 5 Lists to Celebrate Hoppy Boston turning 5! Five years ago this week I officially launched Hoppy Boston. I had no idea what the blog would become, I was encouraged to start it by some friends after a night out recommending beers off the menu at a beer bar. I wanted to start writing something other than scientific papers and patents with the goal of eventually working on a novel, and a blog about beer seemed like a good place to start. No progress on the novel yet, but Hoppy Boston has grown into something beyond my wildest dreams, with an amazing group of people who read, share and discuss the content every week. In 5 years I’ve written 677 posts on the blog with a total word count of 291,142 (not counting this post). There have been a ton of cool stuff that has happened because of the blog, and many amazing beers along the way, so I thought I would celebrate 5 years with a series of top 5 lists that span the history of Hoppy Boston! Where appropriate the links lead to the full posts. Thank you to all of my readers for 5 great years, and I look forward to many more ahead! Top 5 Most Read Articles: These are 5 of the most popular posts (not including beer reviews) in Hoppy Boston’s history based on total page views. How short is the shelf life of a NEIPA? A (kind-of) scientific study. This article was just posted this year but has been my most popular post by far. I need to find more ways to mix my scientific skills with my love of beer. Craft Beer Cellar Blacklist. An interesting controversy for the popular chain of bottle shops. Craft Beer Trophy Hunters. Still a major problem in the beer community. New England Craft Beer Hall of Fame Part 1: My Picks. I was a little disappointed that more readers didn’t chime in with their own lists, but there was plenty of interest in my top 10. Hoppy Boston’s House Beers. The beers I always try to keep stocked in the fridge. Might need an update at some point, but many of the beers listed here would still apply. A Definitive Ranking of Pretty Things Beers. I still really miss this brewery. Beer is Supposed to be Fun, Enjoy it! Can mid- and larger sized craft brewers find success with NEIPA? A question that hasn’t really been answered yet. Every Beek Geek Should Do Blind Tastings. I love blind tastings, it is amazing what happens to your opinions on beers when you can’t see the labels. A Local Beer to Pair with Each of My Favorite Pearl Jam songs. A new article that pairs my love of craft beer with songs from my favorite band. Top 5 Most Viewed Beer Reviews: Apparently people really like to read about Lord Hobo beers, it’s amazing that they take the top two spots. Hoppy Boston being named Drizly’s Beer Blog of the Year in 2017. This was a huge honor, I submitted a few of my favorite articles from last year and a group of judges picked Hoppy Boston as the beer blog of the year in Drizly’s inaugural blogger awards. My role as a contributor to The Full Pint. I never imagined someone would pay me to write about beer, but I have contributed a number of articles to the national beer website The Full Pint, and I have a bunch more in progress. The Mass Brew Bros. blind tastings. Blind tastings are fun and can be really eye opening, the “winners” are almost always a surprise to the panelists. These tastings are especially enjoyable because of the people involved, they allowed me to meet a number of people I interact with on twitter in real life and they are a fun crew to drink beer with. The new Hoppy Boston logo, and the gear that I’ve printed it on. From the beginning I wanted an official looking logo but it took some time to make the investment and get it right. Now I have Hoppy Boston shirts, coasters, stickers, notebooks and some pretty sweet logo glassware. The first times that breweries shared my posts on social media. When I started writing Hoppy Boston I had no idea if anyone outside of a few friends and family members would read the blog, but I planned on using social media to help build and audience. The first few times a brewery shared/re-tweeted my beer reviews were exceptionally exciting, it really helped start the process. The abbey styles: quadrupel, tripel, and dubbel. I love these styles and feel like they are seriously underrepresented locally. Creative and barrel-aged versions of the beers in 1. The number one thing I would want to do if I ran my own brewery (outside of making a killer IPA, since I would need to pay the bills), is creative barrel combos involving abbey beer styles and various wine/spirits barrels. Malty lagers like bock, doppelbock and dunkel. Complex malt flavors and a clean lager finish are a great combination. Dry hopped saisons. I love the interplay of fruity New World hops with expressive saison yeast strains. Requires some experimentation to get right, but the final beers can be amazing. Low-ABV stouts. Too many stouts are all booze, I need more sessionable milk and dry stouts. Top 5 Article “Types”: My articles tend to fall into a few different buckets, these are some of my favorite article “types”. Beer Reviews. Still my bread and butter. Many “serious” beer writers look down on beer reviews, but I’ve always wanted Hoppy Boston to provide recommendations of beers my readers need to try. I try to keep them entertaining (more than just tasting notes) and plan to keep writing them! Random Beer Thoughts and Links. On the last Thursday of the month I do a recap of some of the best beer writing and most exciting news from the past month, along with my commentary on any important topics. This has quickly become one of my most popular articles each month. Opinion Pieces. I am trying to mix in more of these, usually articles reacting to the events of the day in the beer world although they can be about any topic that comes to mind. Brewery Visits. I have been off-and-on writing these articles, but I am trying to mix in some more posts that tell you about the actual breweries/taprooms along with reviews of specific beers. Brewery Overviews. I love this type of article, a deep dive into a single brewery, but I stopped doing them due to the massive amount of work each required. The article style is being revisited now, The Full Pint asked me to do a profile on Trillium and I guess they enjoyed it, they want it to turn it into a series featuring different MA breweries! 5 Article “Types” That Didn’t Really Work Out: I’ve tried a number of types of articles over the years, some haven’t worked out or have fallen by the wayside for one reason or another. Head to Head Beer Reviews. These were OK, I just struggled to find enough comparable match-ups that made for compelling articles. Cooking With Beer. I still cook with beer on occasion (especially stew and chili), but I’m not a good enough cook to write regular recipe articles. Beer Style of The Month. I loved the idea of featuring an underappreciated beer style each month, but it was tough to get enough local examples of most non-IPA styles (especially when you eliminate the beers I’ve already reviewed). Homebrew Recipes. I don’t brew much now for a variety of reasons, and I’m not nearly as good at making recipes as many homebrew-centric writers. Beer Bar Reviews. I love these articles, but I live in the suburbs and have young kids now, my time at non-brewery bars is very limited. 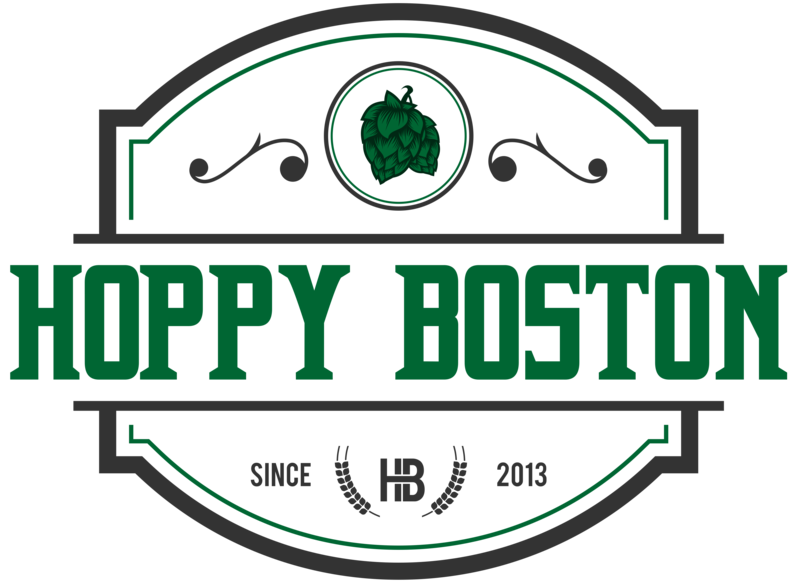 Thanks again to all of my readers, the interaction with you is why Hoppy Boston is still going strong after 5 years. Stay tuned to the blog and social media channels this week for information on a Hoppy Boston gear giveaway! Previous PostHoppy Boston’s Best Beers- Summer 2018 Next PostHoppy Boston T-shirt giveaway!